Check this out! A fixed gear Schwinn for $4 Hundy? Anyone buying this would have to be out of their mind. 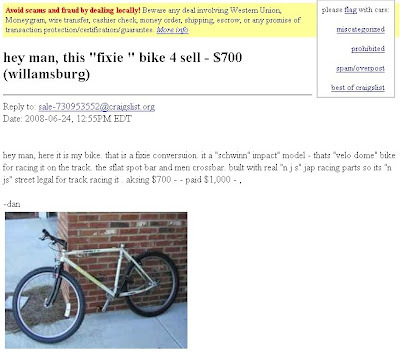 I am surprised, however, that the seller didn't offer the Brooklyn Bridge for free as an incentive to buy this bike. Paid $1000? He must be really stupid if that much was paid for this bike. Invariably this is just a scam/ripoff. Hope no one falls for this. If you click on the image it will bring you to the actual posting - however by the time you are reading this post I am sure it will be pulled. Having to dig deep lately in my pursuit to find more fixed gear mountain bikes. 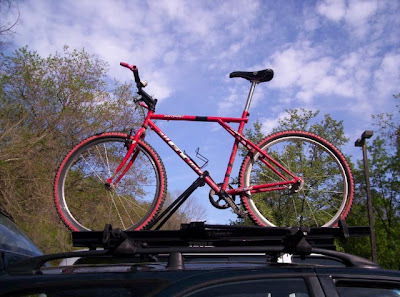 Found a guy with a site that specializes in fixed off road riding, his site is called the BUFFAL0B1LL BIKESITE but it doesn't seem to have been recently updated. Still, there are some interesting bikes here. 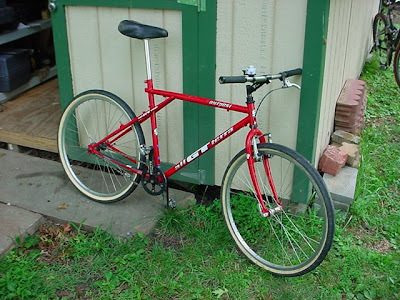 For example, check out his Schwinn Snow Fixie with the Rock Shox Metro fork. I might have to try making one of these if I can get the same fork on the cheap. www.NYCBikes.com had a bunch of these they were selling at a good price. They have the Rock Shocks for $49 and an RST for $20, hmmmm, the possibilities! Here is his late 80s GT conversion. Pretty nice, only one brake for off road riding would make me nervous. By the looks of things the guy might live somewhere down in Virginia or Maryland so one brake is probably sufficient because they don't have real hills down that way. J/K. Means he probably does a lot of skidding to stop. Here is the original incarnation of this bike. It's number 992 on FGG. I thought I might have gone that deep on FGG but maybe I didn't. 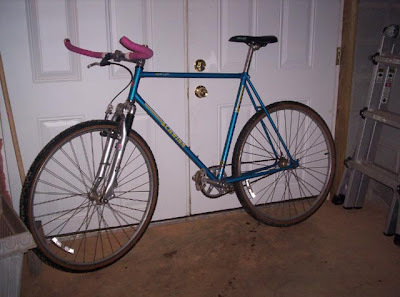 If you have a fixed gear mountain bike, ATB, or cross bike, and would like to have it included in The Friday Fix, at no charge, feel free to email a good picture of it with a short description of the build and what kind of terrain you like to ride it on. To me, if it's a fixed gear and hit has knobby tires, it's an off road bike. As I suspected, the Schwinn Fixie is gone. This posting has been flagged for removal.